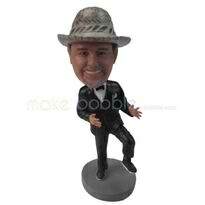 Personalized custom dancer bobbleheads doll in black suit - a love more than a gift! Even the most dedicated working person needs to relax at some point and to hang out with friends, take a break with family or just to enjoy a little solitude. These are things that complete a well-balanced life. Whether your casual down time involves energetic activities, quiet contemplation whilst fishing or simply sunbathing on a fashionable beach, you will find a full range of suitable casual Bobbleheads in our shop.